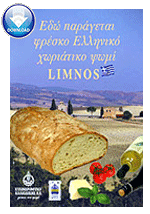 Chalkidiki Flour Mills SA offers you a rich variety of flours to produce exceptional breads and pastries, made from carefully selected grains, produced domestically. Flour from foreign super soft wheat with high gluten. Flour t. 70% specific for the production of pita bread.